to manage risks associated with exposure to diesel exhaust in the workplace. Information on diesel exhaust exposure in the mining sector is available in mining specific guidance. Gases and vapours–these are mostly the gases found in air like nitrogen, oxygen, water vapour and carbon dioxide. There are also hazardous chemicals like nitrous oxide, nitrogen dioxide, sulphur dioxide, and carbon monoxide. DPM can act like a gas and stay airborne for long periods of time. DPM can penetrate deep into the lungs because of itssmall size. The major source of workplace exposure to diesel exhaust is from heavy vehicles that use diesel fuel like trucks, buses, trains, tractors,ships, bulldozers and fork lift trucks. Other sources include equipment in mines, bucket lifts and excavators.All motor vehicles that use diesel fuel generate diesel exhaust when running including during workshop repair or servicing, in car parks, when passing toll booths or in vehicle holds in ships and trains. Diesel exhaust may also be generated from stationary power sources like generators and winch motors including those mounted to vehicles.Thesemay be used in tunnels, alongside railway lines during maintenance work and on construction sites. 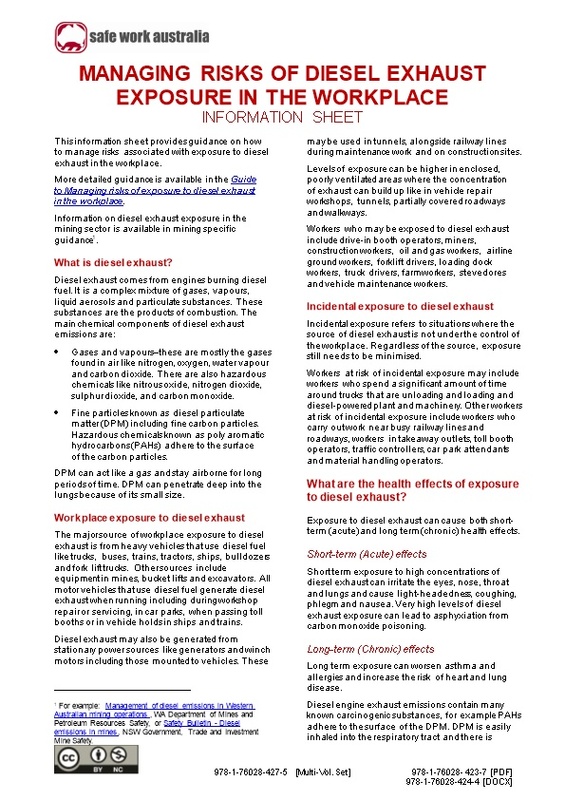 Incidental exposure refers to situations where the source of diesel exhaust is not under the control of the workplace.Regardless of the source, exposure still needs to be minimised. Workers at risk of incidental exposure may include workers who spend a significant amount of time around trucks that are unloading and loading and diesel-powered plant and machinery. Other workers at risk of incidental exposure include workers who carry outwork near busy railway lines and roadways, workers in takeaway outlets,toll booth operators,traffic controllers, car park attendants andmaterial handling operators. What are the health effects of exposure to diesel exhaust? Exposure to diesel exhaust can cause both short- term (acute) and long term (chronic) health effects. Short term exposure to high concentrations of diesel exhaust can irritate the eyes, nose, throat and lungs and cause light-headedness, coughing, phlegm and nausea. Very high levels of diesel exhaust exposure can lead to asphyxiation from carbon monoxide poisoning. Long term exposure can worsen asthma and allergies and increase the risk of heart and lung disease. in an increase in the risk of lung cancer. How can diesel exhaust exposure be minimised? Reducing diesel emissions at the source should be the primary consideration. Strategies typically focus on the fuel, the combustion efficiency of the engine and reducing or removing harmful emissions. The following risk control measures should be considered. Diesel engines can be replaced with engines using cleaner sources of energy including petroleum, propane, compressed natural gas or electricity. Replacing diesel engines will not be practicable in all circumstances and care must be taken that replacements do not introduce other risks into the workplace. If an alternative energy source cannot be used, increasing air flow is the next best way to minimise worker exposure. Diesel exhaust in enclosed areas including when engines are idling or under maintenance can be reduced using local exhaust ventilation(LEV) or general ventilation including improved natural air flow. LEV systems remove diesel exhaust before it gets into the air you breathe. Tailpipe or stack exhaust hoses can be attached to a stationary vehicle running indoors and exhausted to outsidewith an exhaust extraction system where it will not re-enter the workplace or contaminate other areas. General ventilationcan be natural ventilation like opening windows. This can be supplemented by using fans to move air through the work area or to introduce a fresh air supply. General ventilation is not as effective as LEV. be fitted with emission control devices (air cleaners) like collectors, scrubbers and ceramic particle traps—these should be checked often and replaced when dirty. Cracks or holes in cabins of plant with diesel engines and their doors and windows should be sealed to prevent diesel exhaust from seeping in. These should be checked regularly and repaired immediately if leaks are detected. in the exposure area should be reduced, where reasonably practicable. Work planning and scheduling is a method of reducing plant and worker interaction. Some workers, for example diesel plant operators can work from fully sealed and air-conditioned cabins. In vehicle repair workshops a separate area could be used for diesel plant to prevent exposure to workers in other areas. Respirators are the least effective method of minimisingdiesel exhaust exposure and should only be used when it is not possible to control diesel exhaust exposure in other ways. Respiratory protective equipment (RPE) may be appropriate in some situations however you should get advice from a competent personlikean occupational hygienistif you are not sure. Specific types of respirators must be used to reduce diesel exhaust exposure. P2 disposable respirators (Figure 1) may besuitable if the concentration of vapour in the diesel exhaust is low. Half or full-face respirators (Figure 2) with a filter cartridge that protects against gases, organic vapours and particlesare generally moresuitable. Note: Air purifying respirators do not protect against all hazardous gases. Respirators need to be properly stored, inspected, cleaned and maintained. Workers should be trained and fit-tested to use a respirator. AS/NZS 1716:2012: Respiratory protective devices. Do I need to measure diesel exhaust? There is no workplace exposure standard for diesel exhaust. Some of the individual components of diesel like carbon dioxide, carbon monoxide and inhalable or respirable dust can be monitored to provide an indication of diesel exhaust levels. check the effectiveness of control measures provided e.g. particulate filter, LEV, general ventilation and RPE. When it is obvious there is a problem, for examplewhen workers report adverse health effectsincluding headaches, dizziness, nausea or irritation of the eyes, nose or throat, control measures must be reviewed immediately. Workplace air monitoring should be done with advice from a competent person like an occupational hygienist. Air monitoring for diesel emissions involves specialist equipment and techniques. For control of diesel exhaust in specific situations like workshops, railways and toll booths see the Health and Safety Executive’sControl of diesel engine exhaust emissions in the workplace. For example: Management of diesel emissions in Western Australian mining operations, WA Department of Mines and Petroleum Resources Safety, or Safety Bulletin - Diesel emissions in mines, NSW Government, Trade and Investment Mine Safety.